— Our first glimpses of the 2019 Volkswagen Arteon came almost a year ago when it made its debut at the 2017 Geneva International Motor Show. Fast forward 11 months, and the Arteon is finally making its stateside debut at the 2018 Chicago Auto Show. 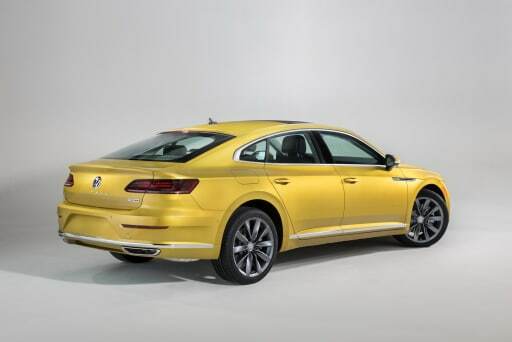 The previous information that we had about the Arteon came from the European versions of the car, but when it crosses the Atlantic, there'll be some changes to the car that appears here for the U.S. market. For example, the European version had six different powertrain offerings, but here we'll only get one Used Engines : a turbocharged 2.0-liter four-cylinder that makes 268 horsepower and 258 pounds-feet of torque. If that Used Engines sounds familiar, that's because it's a retuned version of the Used Engines also found in the Atlas SUV and Golf GTI. An eight-speed automatic transmission and front-wheel drive are standard, with all-wheel drive available on each of the Arteon's three trim levels (SE, SEL and SEL Premium). The Arteon will be longer and wider than the outgoing Volkswagen CC that it's replacing. It will also have a wheelbase that's just over 5 inches longer (111.9 inches compared with 106.7 inches), which translates to more interior room, though we're still waiting on those exact specifications. Volkswagen also clued us in to what interior features will be standard for the Arteon: push-button start, tri-zone automatic climate control and an 8-inch touchscreen for the multimedia system, with standard Android Auto and Apple CarPlay connectivity. Volkswagen's Digital Cockpit display is optional, as are a panoramic moonroof, premium audio system and a power trunk with automatic opening that's activated by kicking a foot under the rear bumper. Our preview for the Arteon mentioned an Emergency Assist system, which brakes the car and steer it into a nearside lane if the driver becomes incapacitated. Unfortunately, that system won't be included on the U.S. version of the car. Standard safety features do include a backup camera, forward autonomous emergency braking, blind spot warnings and a "reactive hood," which we're guessing is a mechanism that pops the hood to create space between it and the Used Engines to soften the blow in a pedestrian collision. Also available will be adaptive cruise control, lane keep assist, automatic high beams, around-view camera system and a parking steering assistant. The 2019 Arteon will make its way to dealerships this summer. Stay tuned for more of our Arteon impressions straight from the floor of the 2018 Chicago Auto Show.